The initial establishment of Coastguard stations in Ireland was overseen by James Dumbrain, Comptroller General of the Irish Preventative Water Guard. Skerries Coastguard was one of only five stations initially established in the Dublin area in 1821. The nearest station to the South was located at Rush, (overlooking the harbour) and to the North at Nannywater (near Laytown). In January 1822 an additional Coastguard station was added at Portrane, Co Dublin. Later in 1822, two additional Coastguard stations were established in the area; one at Balbriggan, 8 miles North of Skerries and one on Lambay Island, off the coast of Rush. Later in the 1800s Coastguard stations would also be established at Loughshinny and Rogerstown harbour, Rush. 1820 Book of Establishment for Skerries Coast Guard station. Extract from Admiralty archives ADM 175/13. The original Skerries Coastguard station was sited at Red Island, near to where the Sea Memorial Pole is now located. Lieut. William Smith is listed as the first Chief Officer, appointed 19th December 1820. 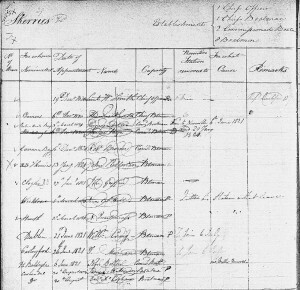 The extract from the book of establishment [above right] lists the names of the initial crew and date of appointment. When a crewman left the station, their name was loosely crossed out on the establishment book – hence the scribbles. In 1873: Wreck of the Sarah Ann, a Runcorn Scooner, on rocks off the Balbriggan coast. Sadly a number of the rescuers lost their lives, including Albert Fanning a Boatman member of Skerries Coastguard. Albert had helped to crew the Skerries lifeboat during the rescue. Five local volunteers with the Skerries lifeboat also lost their lives in the rescue. 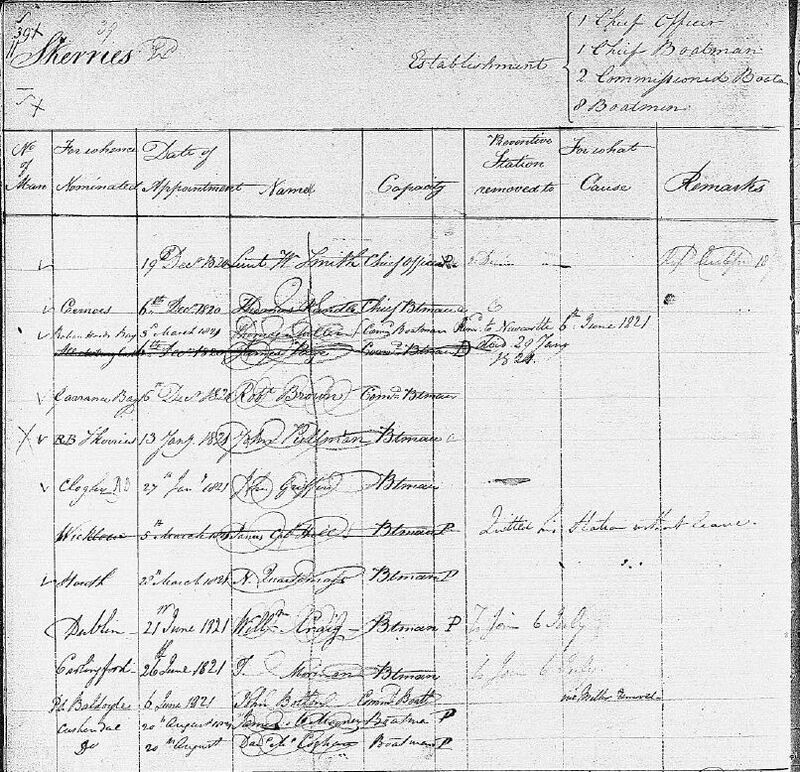 In 1878: Thomas Elmore is appointed Chief Officer of the Coastguard station at Skerries. 1907 Royal Humane Society; Testimonial to William Gillard, Coastguard boatsman, Skerries Co Dublin, for his rescue of a youth named McGarry who fell from Skerries pier on 14th June, Gillard has previously received recognition for saving life. (Irish Times 20th July 1907). In the war of independence many of the Coastguard stations were burned to the ground by Irish Volunteers, having being declared legitimate targets by the Irish Republican Army. This followed a similar fate of the Royal Irish Constabulary (RIC) barracks in the area at the time. The Skerries Coastguard station was recorded as being destroyed in a fire on Saturday 18th June 1921, along with other nearby stations in Loughshinny, Rush and Rogerstown. At two o’clock on Saturday morning the Coastguard Stations at Skerries, Loughshinney, Rush, and Rogerstown, all in County Dublin, were burned to the ground by unknown men. The same procedure appears to have been adopted by the raiders in all cases. was established. The formal date of re-establishment of the Skerries station was 4th July 1923. Skerries was assigned station number 3 of the Eastern District. Two other CLSS stations were sited to the North: at Greenore and Clogher Head, Co Louth. To the South the nearest station was at Dun Laoghaire. 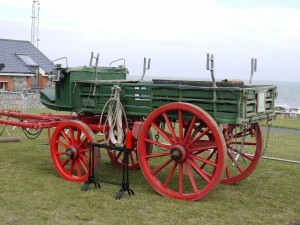 The local contractor for Horses is listed as Mr John Seaver, whereby horses would be used to draw the Rocket Life Saving Apparatus Cart to the scene of a shipwreck. Interestingly, Mr John Kelly was also listed as the No.1 man in February 1915. 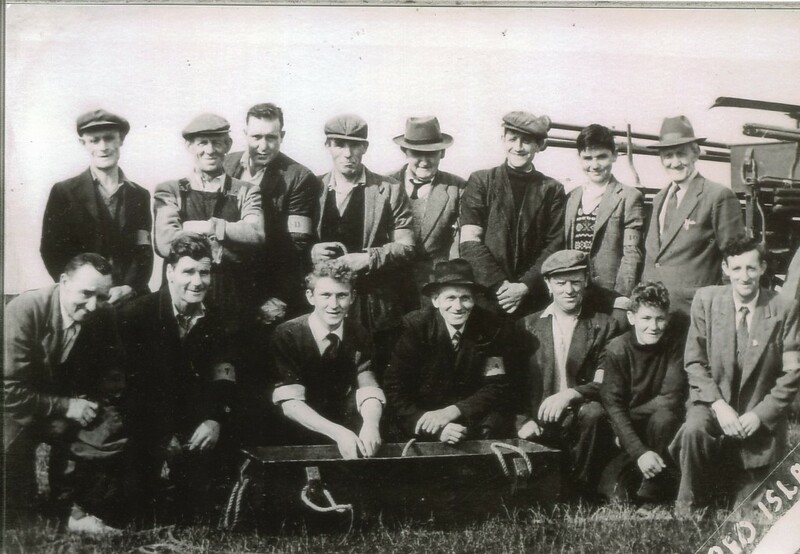 Much of the 1923 crew would have previously served with the Coast Guard at Skerries prior to the CLSS establishment. The method of calling the Life Saving Company (team) together for the purpose of affording assistance to vessels in distress consisted of the No.1 Man firing one Maroon rocket signal. This emitted a very loud signal that would have reverberated across the town. This signal also served the purpose of indicating to a vessel in distress or to any Lighthouse or Lightvessel signalling for assistance that the distress message is received and is being attended to. If he is of the opinion that the Life Saving Apparatus can be successfully employed, he will at once make arrangements for the transport of the Company and all necessary apparatus and proceed to the scene of the wreck as quickly as possible. If it appears to be a case for the Life Boat, he will communicate at once with the nearest coxswain either by telephone or messenger. 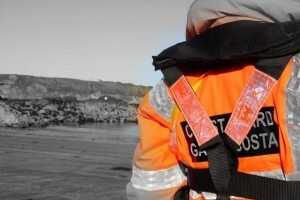 The Coast Life Saving Company will render any assistance that may be required to launch the Life Boat, and will stand by in any case their services may be required either with the Life Saving Apparatus or otherwise. On 19th September 1934 James Mansfiled (a Painter of “Altona” 86 Strand Street, Skerries) joins the Skerries Coast Guard team. James would later become the No. 1 Man (Chief Officer) during much of the late 1930s and 1940s, assisted by No.2 Man Christopher Shiels. In 1937, Walter Howlett (a Labourer of The Cross, Skerries) joins the Skerries team. Walter would become the No.1 Man for much of the 1950s and 1960s. Skerries Coast Guard’s former Rocket Cart. Now on public display at Newbridge House, Fingal. The Unit was equipped with a horse drawn cart. This was used to carry the team and the Life Saving Appartus equipment to the scene of an incident. The cart could also be drawn short distances by hand if required. 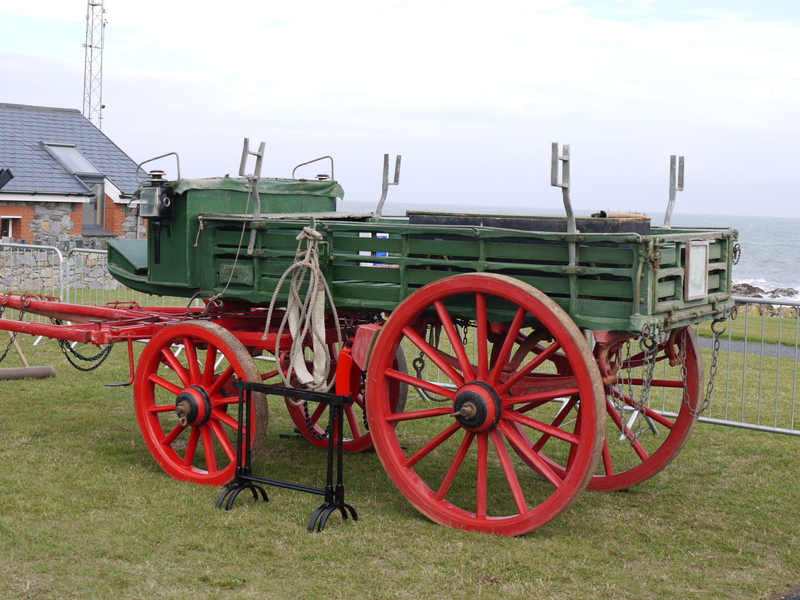 The original Skerries Coast Guard rocket cart is currently on loan to Fingal County Council and is on public display at Newbridge House & Farm, Donabate, Co Dublin. The Life Saving Apparatus kit comprised a defined list of equipment. The image below is a copy of “list of stores to be kept in Cart” notice issued by the Board of Trade, November 1877. This notice listed all the items carried in the Cart and was to be affixed to the outside of the Tail Board. This served as a useful reference list for the team. 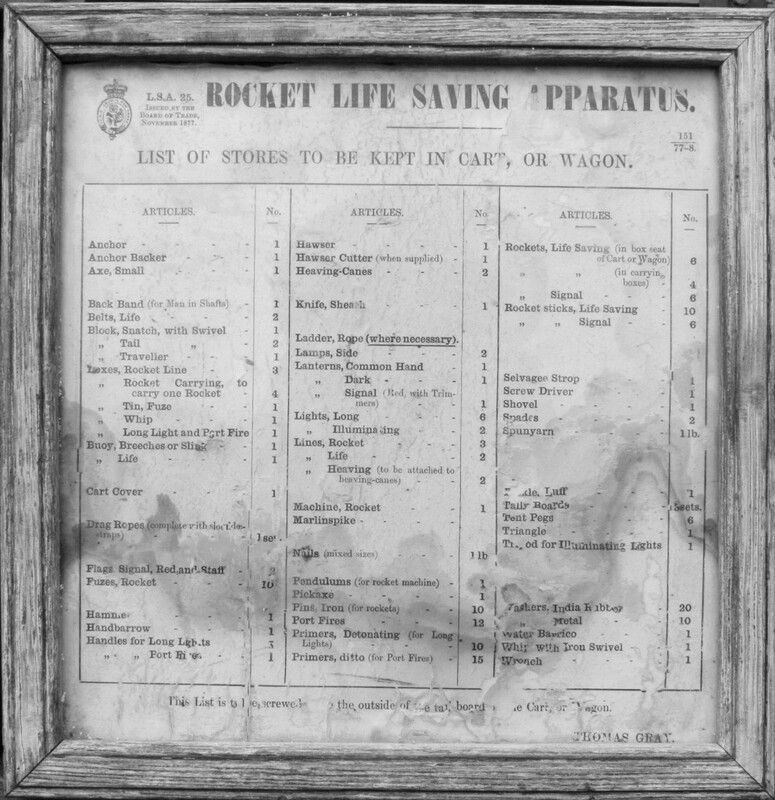 The image below is taken from the list affixed to the former Skerries Coast Guard Cart. Some of the items carried included: Signal flags, heaving canes, spades, port fires and tally boards. In operating the Rocket Apparatus, each man was assigned a numbered armband. Each number signified a particular role to be carried out in the rescue drill. In the crew picture below from a training exercise at Red Island, Skerries 1958, each man can be seen wearing their numbered armband, usually on the left arm. The rocket apparatus kit was stored in several heavy wooden crates with rope handles, one of which can be seen at the front of the photo. The front of the rocket appartus cart is also visible in the background of the photo below. Back row (L-R): John Joe McGuinness, Walter Howlett (No. 1 Man), Mattie O’Hara, J McQuaine, Tommy Boylan (No. 2 Man), Jimmy Manson, Jack Beggs, and visiting Coastguard Captain Frayne. Front row (L-R): Jem Dillon, John Guildea, Seamus Hand, John (Jem) Seaver, Larry Davey, John Hand, Francie Grimes. Like many other CCLS teams around the coast, the Skerries crew carried out exercise drills on the use of the Rocket Apparatus kit every one to two months. These drills were often carried out nearby at Red Island and overseen by the CCLS District Officer from Dublin. Informal competitions would be held among the crew at each drill on key skills; throwing the heaving cane, semaphore, Morse code, with small cash prizes awarded by the District Officer for the winners of each skill. The current Skerries Coast Guard station at Red Island was constructed in the 1960’s and remains in operational use to this day. A local builder from Red Island, Skerries won the public tender to build the station, constructed from concrete blocks and pre-cast concrete sections. Additional modernization of the building has continued to the present day but the original structure is largely unchanged. 1991 change of service name to Irish Marine Emergency Service (IMES). As part of a nationwide service upgrade, the first motor vehicle is assigned to the Skerries station. The Ford Transit van could carry 3 crew and was used to transport the full rescue kit to the scene of an incident and significantly reduced incident response times. 2001 change of service name to the Irish Coast Guard (Garda Costa na hEireann) which is still in use today. This is often abbreviated as “IRCG”. The current service logo features an intertwined anchor and harp. Note, the new spelling of Coast Guard as two separate words. Further enhancements to the Skerries station continued with the provision of the first 4WD (4 wheel drive) emergency vehicle in 2005 (a Toyota Hilux crewcab). A second 4WD vehicle arrived on station in 2015 followed by an All Terrain Vehicle (ATV) Polaris Ranger in 2018.